This digital collage was made directly in my computer. Bits of old anatomical illustration show a figure displaying his musculature as he holds up, shroud-like, in one hand, his removed skin. His other hand holds the dagger with which he skinned himself. (I don't recall where this came from any longer.) (Detail right). 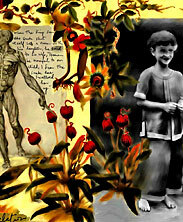 This piece was also made with other appropriated bits: a botanical print from the 19th century, a (software) 'painted' pomegranate, and an early portrait of me in my favorite Chinese silk pajamas, as well as a handwritten narrative celebrating the ephemeral magic of childhood and of fairy tales. Details of the pomegranate are below to the left, and the pajama detail is below on the right side of the page. 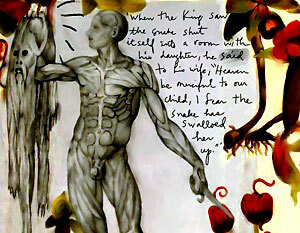 The hand written part by the flayed anatomical figure reads as follows: "When the king saw the snake shut itself into a room with his daughter, he said to his wife, Heaven be merciful to our child, I fear the snake has swallowed her up". And below that insert, are the words Reveal/Revelation. Snakes are living symbols and have been animal allies in my life, both in my dreams and in my garden. I even lived with a reticulated python once, but that is a story for another time and place! Of course the symbolism of snakes is very much about change and renewal indicated by the cyclic shedding of their skins. The ancient Greek symbol of the ourobouros, a snake that holds its own tail in its mouth, represents the unbroken circle of life everlasting, of life renewed and recreated. It is at once a symbol of immortality and of the transformative cycles of life, death and rebirth. The snippet of fairy tale narrative offers a classic reference to a transformation story. Other symbols in the piece, like the picture of me as a child, Persephone's pomegranate and the fruiting vine also pay tribute to the fleeting nature of existence, and the need to transform our spiritual perspective as we progress on the path. 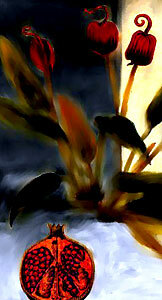 Soulmate Search is being offered in a signed, limited edition of 250 prints 11" x 8.5" semi gloss photo paper. You can see a detailed closeup above on the right.